An Egyptian god, whose name occurs in Jer. xlvi. 25 ("Amon of No," R. V.) and in Nahum, iii. 8 (No-Amon). He was originally only the local divinity of Thebes; but on the accession of the eighteenth dynasty, became the supreme ruler of the Egyptian pantheon, and official god of the empire. In this rôle the name continues to appear even in the titles of some of the Ptolemies. The Libyans and Ethiopians accepted Amon as their highest divinity; and the Greeks identified him with Zeus. When represented in human form, he was commonly given a blue skin and a head-dress of feathers, similar to that of Min of Coptos. Frequently, however, he was portrayed with the head of his sacred animal, the ram. The earliest vocalization of his name—it does not admit of any certain etymology—is found in the El-Amarna tablets, viz., "Amanu" (compare the Ethiopian pronunciation, "Amen"). Later the name was pronounced "Amon," and still later "Amun," or, without the accent (in the status constructus), "Amen." The Greeks, following a popular pronunciation, doubled the "m" = "Ammon." Identified with the sun (Rē'), like most Egyptian gods, he is also frequently called Amen-rē'. 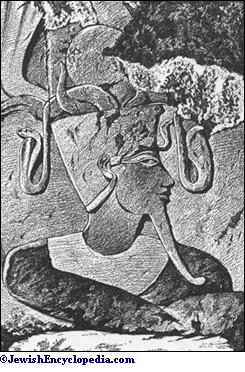 Bas-relief showing Amon, Egyptian God. 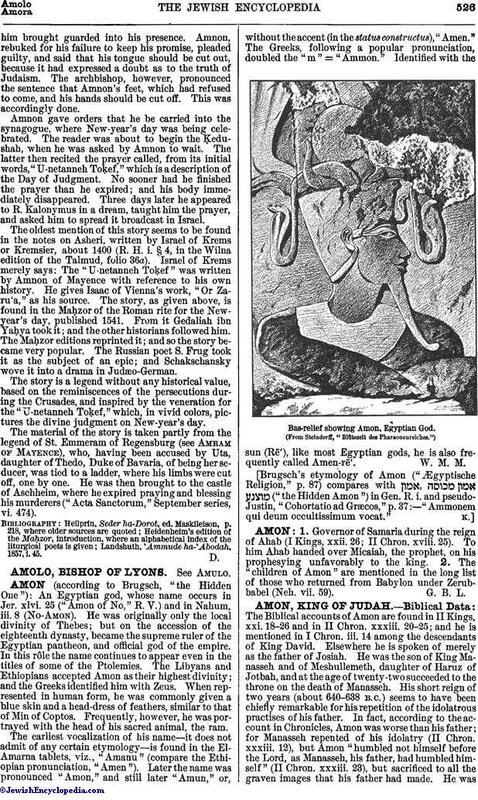 Brugsch's etymology of Amon ("Ægyptische Religion," p. 87) compares with ("the Hidden Amon") in Gen. R. i. and pseudo-Justin, "Cohortatio ad Græcos," p. 37:—"Ammonem qui deum occultissimum vocat."